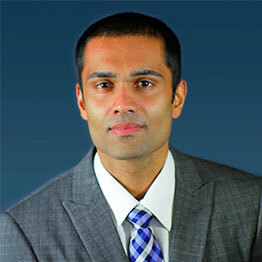 Dr. Alencherry graduated from Cornell University with a Bachelor of Science degree in Molecular Biology and Concentration in Applied Economics & Management. He earned his medical degree in Podiatric Medicine and Surgery at the New York College of Podiatric Medicine in New York City. He continued his education with a four year Residency at the New York Hospital Queens, where he was appointed Chief Resident in his final year. He has comprehensive training in elective, reconstructive and trauma surgery of the foot and ankle. He also is trained in the most advanced non-surgical and minimally invasive treatments of common foot and ankle conditions. He has an interest in treating the pediatric population and has experience treating congenital deformities. In addition, he has completed several courses and has received training in external fixation and deformity correction techniques at the Ilizarov Institute in Russia. He is Board Certified by the American Board of Podiatric Medicine and the American Board of Foot and Ankle Surgery. He is a Fellow of the American Board of Foot and Ankle Orthopedics and Medicine and of the American College of Foot and Ankle Surgeons. He is an active committee member for the New York State Podiatric Medical Association and a proud member of the American Podiatric Medical Association. He serves as the Director of Clerkships for the Podiatric Surgery and Medicine Residency program at New York Presbyterian/Queens Hospital. He is also affiliated with Northshore University Hospital, Long Island Jewish Hospital, Lenox Hill Hospital, and is actively involved with their Residency programs.